Federal leaders emphasized the importance of cybersecurity and partnerships with the private sector at the Aspen Security Forum on July 22. 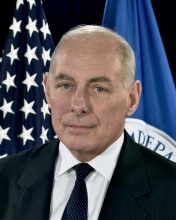 Secretary of Homeland Security John Kelly said he agrees with the decision of former DHS Secretary Jeh Johnson that made election systems critical infrastructure and told the states that DHS would offer help if they wanted it. Kelly said that DHS “should be” the designated agency in charge of defensive cyber activities. However, there are several agencies within the Federal government, including the Department of Defense, the FBI, and the National Security Agency, that have their own cybersecurity roles, which makes it important for the agencies to communicate with each other. When the Federal government was monitoring the WannaCry attack, Kelly said that although all of the defense agencies were in the room offering advice, the DHS team was central to the debate. Kelly plans to visit Silicon Valley to meet with technology executives from companies including Facebook to discuss the implications that cyberattacks and extremist propaganda can have on social media and other popular websites. What are the early grades on the new administration’s response to the growing cyber threat? How can collaborative tactics and integrated intelligence tools strengthen a proactive cyber defense? Join us at the sixth annual Cyber Security Brainstorm on Sept. 20 at the Newseum to discuss the cyber strategies and opportunities that can keep our Federal government one step ahead at all times. Click here to learn more and register. NSA Director Adm. Mike Rogers said that the rate of change in the technology and communications capabilities of the Unites States’ adversaries is the fastest that it has ever been in Rogers’ 31 years in the Federal government. Rogers is also talking to technology companies in Silicon Valley about discouraging extremist language online and how to better cooperate with one another. Rogers said that the intelligence community, private companies, and civilians should discuss what the policy should be surrounding encryption. Technology companies could build back doors into encryption or build strong encryption that either allows or blocks the intelligence community’s access to data. Rogers said that the intelligence community shouldn’t be the ones making the decisions about how powerful encryption capabilities should be because the users should decide what level of privacy versus protection they’re comfortable with. When President Donald Trump met with Russian President Vladimir Putin earlier this month, he exited the meeting and tweeted about ideas to form a joint Cybersecurity Unit between the United States and Russia. After receiving backlash from Republican lawmakers, Trump dialed back this idea, tweeting that he didn’t think it could happen.